Unless you’re working for a “mega-church” you probably don’t have staffed audio engineers. Neither do we. When considering a new console, friendliness to volunteer audio engineers is really important. I’m not always able to be the one behind the desk, so having a desk I know I can quickly train a non-professional to use effectively is important. Since installing the GLD-80 I’ve begun to depend more and more on presents, especially when it comes to training and empowering volunteer staff. Since most (okay… none) of our Sunday audio engineers have official schooling on audio engineering and I don’t have the time (or ability, honestly) to teach professional audio engineering, we have to depend on presets to help make things easier. I’ve created presets for each of our regular musicians and vocalists, and all of our engineers use the same saved show every week which contains all our effects and routing. This is a huge time saver. On Sunday morning all the engineer has to do is load up the show and recall the presets for the musicians and vocalists performing in that set. At that point they are 90% of the way there. This leaves lots of time for learning the set (lead instruments and vocalists) and fine-tuning things (EQ’s and effects). I highly recommend that unless you have full-time staff, you have all your engineers share presets and shows. That way every week builds off the tweaks and improvements from the previous week’s changes and you can all make improvements to the overall “sound” of your church’s worship as a team. Giving each engineer their own layout or routing puts you all into silos and removes the huge potential teamwork benefits digital consoles offer. Tip Share presets and shows! It’ll help you improve your overall sound week to week, and keep your whole team on the same page. Overall I’ve been blown away by the mixes we’ve been getting from the GLD-80. I’d like to say it’s because I’m just an incredible engineer, but really it’s because of the great features and effects the GLD-80 comes with. 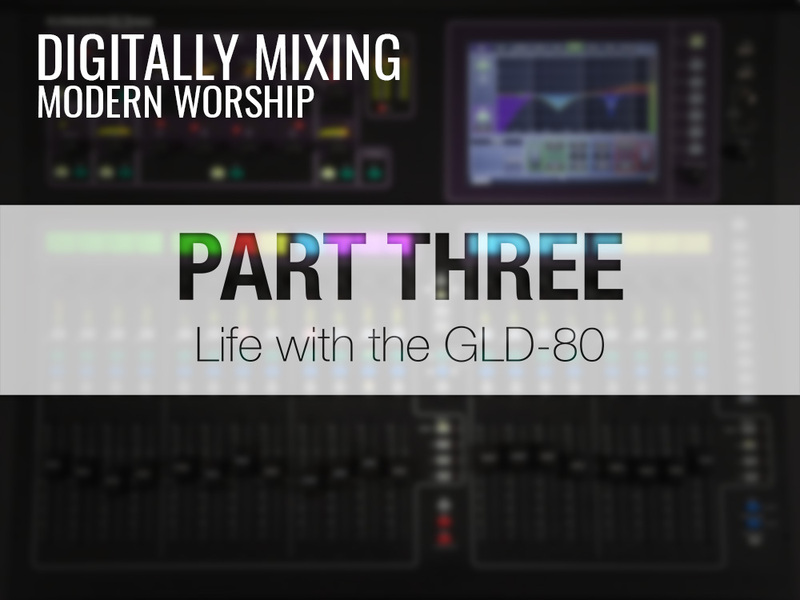 The GLD-80 can make it incredibly easy to get a good basic mix. They key is using many, many stages of compression and processing to help smooth things out and give you a good foundation to work with. Tip Utilize the many stages of processing and compression the GLD-80 offers. It’ll help keep your mix smooth, balanced and clear without being piercing or requiring constant fader-riding. The main thing is taking out those high mids that often cause the vocal to sound piercing or harsh, especially if you have a dynamic female lead. This stage helps keeps the vocals even as a group. Instead of simply compressing the lead vocal during a dynamic jump, the entire vocal group is compressed to keep the balance consistant. Similar signal chains are used for each instrument, but the point is that when you take advantage of the incredible processing capability of the GLD, it makes your life easier. I wrote a whole seperate post addressing Dante. Dante helps clean up noise and reduce the need for analog inputs on your stage or at the GLD. If you don’t have it yet, get the Dante Virtual Soundcard and use it for all your digital audio. We aren’t producing live recordings or anything, but we do record a stereo bus every week, and the GLD has certainly helped with this. I have our recording bus set up as an aux, with almost every channel set to be in the aux post-fader at unity (0 dB). This means the recording is basically a copy of the main mix. Then I set a couple of channels (room mics, emcee mics, etc) as pre-fade and mix them manually to make sure they sit correctly in the recording bus. I also use a bus compressor to help keep the overall recording level as “normalized” as possible to minimize the amount of post-processing we need to do.